It's official - someone stole the Image Comics 'Approved' stamp, and went nuts on the pile of pitches the company received. 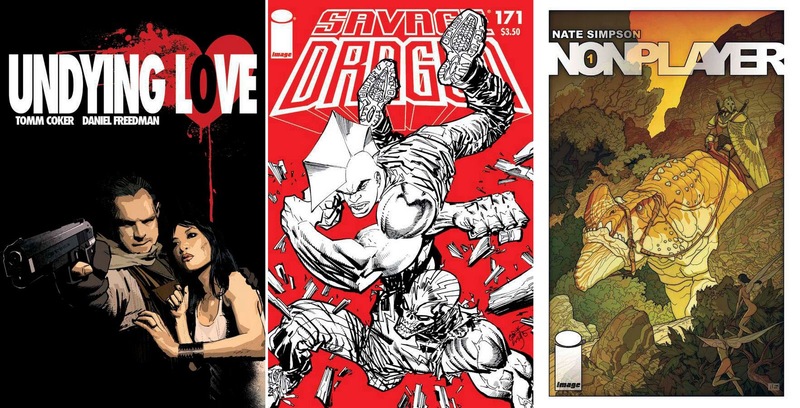 In April six new #1's kick off (seven if you include Top Cow), plus one-shots for Walking Dead and Madman - crazy!! Still of all the covers both new and old, these four stand out from the rest to lead the charge. COVER OF THE MONTH: BLUE ESTATE #1 - Kalvachev Yeah it took me a while to realise the whiskey was being poured from a gun too. Of all the pulp titles kicking off in April, Blue Estate covers in one image just what all good pulp is made of; hard drinks and harder women. 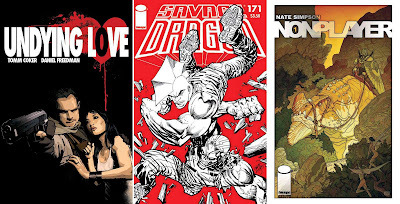 CLOSE CONTENDERS: Tomm Coker and Daniel Freedman - Undying Love #1, Erik Larsen - Savage Dragon #171, and writer/artist Nate Simpson - Nonplayer #1. For more Image April #1's and other numbers click the jump. Oooh. That's pretty cool. Very in keeping with old pulp covers. Man...that is sweeeeet! Phillip Marlowe eat your heart out! Thanks for the comments ladies! I love good pulp done right, and like you both say this ties into the best!